We're one of three finalists vying for the Treat Staff Fairly award on October 1st. Today, we've been named as one of the UK-wide restaurants on the shortlist for the Treat Staff Fairly award, at the Food Made Good Awards 2018, the Sustainable Restaurant Association’s (SRA) annual industry leading accolades for the most progressive purveyors of food and drink. This award is one of 17 that will be presented at a special ceremony on 1st October at FEST Camden in London. The Food Made Good Awards recognise restaurants and foodservice businesses whose extraordinary accomplishments in the last year are helping diners use the power of their appetites wisely. Chef Director Neil Forbes said: “I'm absolutely thrilled to be nominated in the Food Made Good Awards Treating People Fairly category. Funny really, how my staff see this as a normal place to work, but all the extra little things we do, some may take for granted. I really do care about the people that work with me. Cafe St Honoré is a wonderful place to work and we have a great team of loyal, committed and professional staff. Fingers crossed we come home with this most prestigious award on the 1st of October." The Treat Staff Fairly award, sponsored by Freedom Brewery, is designed to recognise progressive employers who’ve led the way in attracting and retaining staff by remunerating them properly and by devising innovative way of rewarding them beyond the paycheque. The 2017 winner of this category was Pizza Hut Restaurants, who, after introducing emotional training for all staff, saw job applications soar to 150,000. The Food Made Good Awards recognise restaurants and food service businesses whose accomplishments in the last year have driven progress in the industry and demonstrated that all food can be made delicious, ethical and sustainable. The shortlist is a treasure trove of concepts proven to make a positive difference. Every operator can find at least one great idea to try in their business. It's no secret that everything we do at Cafe centres around the very special people who supply us with their superb ingredients. Our producers, those hard-working artisans who are so passionate, and ensure we always get the very best produce possible. Come rain or shine! So we decided it was time to celebrate and invite them to dinner. And of course, you as well! Throughout the evening, our producer guests will share their stories as you enjoy tasting their produce. We hope this will be a wonderful and memorable way to connect with the food on your plate. 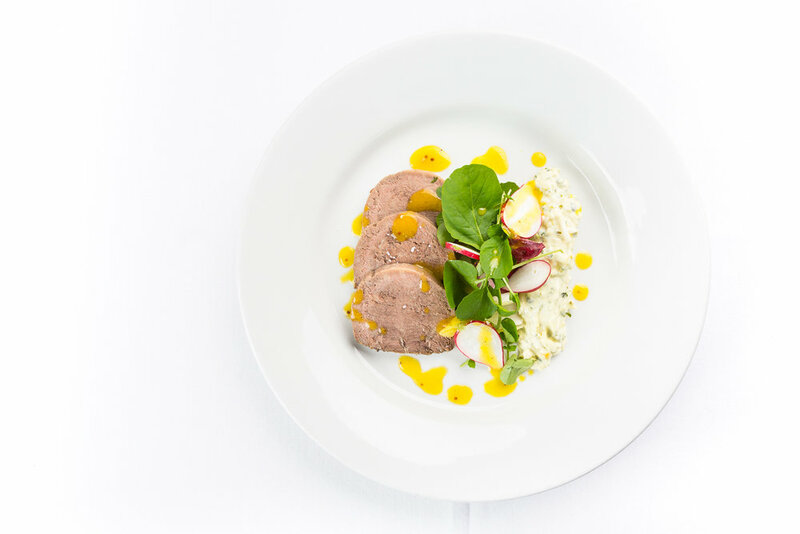 £60 per person, including a glass of fizz on arrival, 5-course dinner and tea/coffee. Our wine-loving general manager James Mackenzie explains why decanting helps enhance the taste of all wines. Let's be honest, many of us have a decanter of some sort. Often given as a 21st birthday, wedding or retirement gift, many find their way to the back of a cupboard, or for the more imaginative amongst us, are used as a flower vase. Yet they possess a secret power - they can make cheap wine taste good, and good wine taste excellent! Like most aspects of wine appreciation, decanting is often seen as just another one of those ceremonious and pompous activities undertaken by wine snobs (smelling the cork after opening the bottle tells you nothing about the wine, btw). These people inhabit films, sometimes fine-dining restaurants, and have managed to make the subject of wine seem impenetrable. Whilst many traditions surrounding the service and consumption of wine seem can seem a little intimidating, decanting wine is something I urge the everyday wine drinker to try for these three reasons: the first is to remove sediment from the wine; the second is to expose the wine to oxygen, allowing it to breathe; and the third is a bit of both (read on). The first reason, to remove the sediment, is quite important if you have an older wine, or you’ve aged a special bottle. As wine ages, natural molecules in the wine bind together and fall to the bottom of the bottle forming a sediment. This is more common with red wines, but can also occur with some whites and rosés. Sediment is completely fine to consume, but if you like drinking wine without a muddy texture, it’s best to try to get rid of most of the sediment. To do this you’ll need a decanter and a candle. Before you begin, leave the bottle in the same position for a day or two - either standing up or lying down. If it’s lying down, make sure you don’t rotate the bottle during the decanting process. When you’re ready to decant, open the bottle as gently as possible so as not to undo the settling process. Then, with a lit candle positioned so you can see clearly through the neck of the bottle (do not place it too close to the bottle or you will heat the wine), begin to slowly pour the wine into the decanter. As you pour, keep the candle shining directly through the neck of the bottle until you start to see the ‘smoke’. This is the precursor to the sediment proper and looks a bit like, well, smoke. At this point, you need to slow the speed of pouring. Now, the next bit is up to you. Either stop immediately or chance your arm and continue until the smoke becomes slightly denser and then stop. It's your choice, but if you get greedy you run the risk of ruining the whole process, ending up with a lovely mix of sludge and wine. Leaving a little bit in the bottle may seem a like a waste, but read Aesop's fable, The Dog and The Bone, and the reasoning will become apparent. It’s the second reason applies young wines bought for almost immediate consumption. Throughout much of the production and bottling process, wine spends most of its time in a fairly oxygen-free environment, often developing unpleasant aromas that can be expelled on contact with oxygen. Many wines under screwcap are bottled with a small amount of gas between the wine and the seal which can also result in an 'off' smell when the bottle is first opened. Decanting is the perfect solution to get rid of these odours and is a very easy process. All you need to do in this scenario is pour the wine - quite vigorously - into the decanter. The aim is to introduce as much oxygen as possible to the wine. Then let the wine sit in the decanter for a while. Any length of time is good, but an hour or longer is best. Just as we need oxygen to live, so does wine. The interaction between the wine and the air will bring out its best. argue that continued contact with these sediments give their wines fuller character and style. And who are we to argue. When decanting these wines, employ the same technique as with older wine – let the wine settle, decant it gently and don't be greedy. Decanting these wines also achieves the aim of exposing them to oxygen and letting them fully open up. Wine will forever be a topic that divides opinion, but that should never stop us from enjoying it. If decanting a bottle of cheap plonk heightens our enjoyment, then why not do it. Whether you spend £5 or £500 on a bottle of wine, it’s always worth considering decanting before drinking. No decanter? Decant the wine into a clean jug before pouring it back into the original bottle using a funnel. Do not do this with older wines though, as it will cause too much contact with air. No candle? Use the torch on your phone. Can't be bothered doing the whole waiting for the smoke thing? Place a coffee filter paper and a funnel into a decanter or jug then pour the whole bottle through slowly. The wine snobs will never agree with this one but it works, and works well! When somebody opens a bottle of wine and smells the cork? Ask them why they are doing it. Dining at Cafe St Honoré, or anywhere else? Do not hesitate to ask for your wine to be decanted. It’s always an honour to be asked to cook at the magical Secret Herb Garden. Owners Hamish and Libby are such great hosts and create a truly special atmosphere for their guests. We thought you might enjoy seeing a few pictures from the night. The menu was simple, and replete with fabulous ingredients including a few from the garden. There’s nothing quite like cooking over an open flame outdoors. And oh how we wish we had room for a cheese cart at Cafe. Perhaps Neil’s favourite part of the evening! On Tuesday 25th June we hosted a lunch to launch Food Made Good's One Planet Plate campaign in Edinburgh. The campaign encourages restaurants to highlight dishes on their menus that address problems in the food system and gives chefs the opportunity to demonstrate to diners how they’re contributing to a better food future. Criteria for a One Planet Plate dish includes using more veg, no waste, a low carbon footprint, celebrating local ingredients, sourcing fish sustainably and using better meat. Visit the One Planet Plate website to discover sustainable recipes from restaurants across the globe, including Neil Forbes' recipe for mussels, with shallots, garlic, cream and tarragon. Join us on Saturday 16th June for a special Summer Masterclass with chef Neil Forbes. 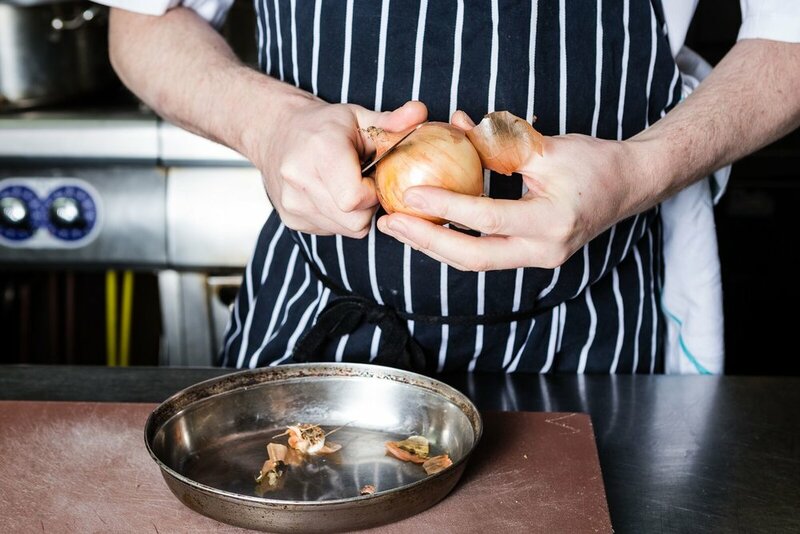 Neil will be selecting the very best local ingredients from land and shore to create a series of dishes that encapsulate the flavours of summer, demonstrating a wide variety of techniques to help you get the most from Scotland's larder over the summer months. 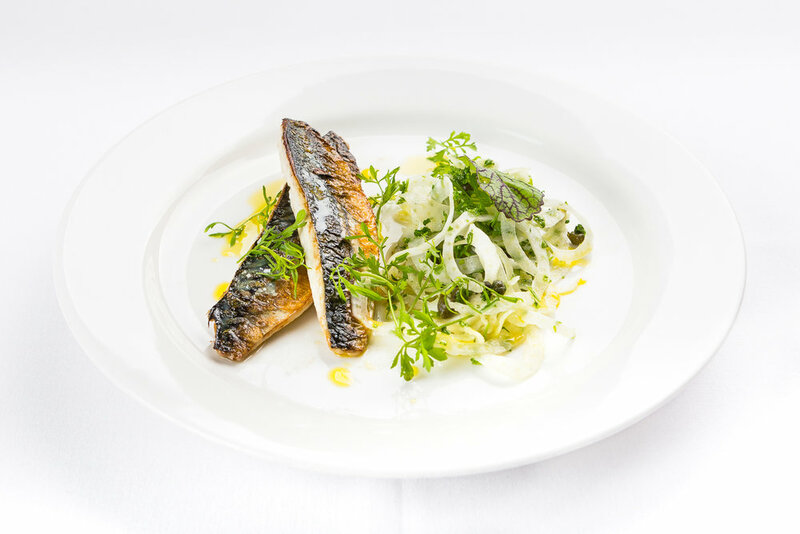 Dishes will include confit sea trout, steak with salsa verde, a light fish stew, organic chicken in a cream and herb sauce, a gooseberry fool, salads and dressings; as well as an array of fresh fruit and veg including asparagus, Isle of Wight tomoatoes and berries galore. 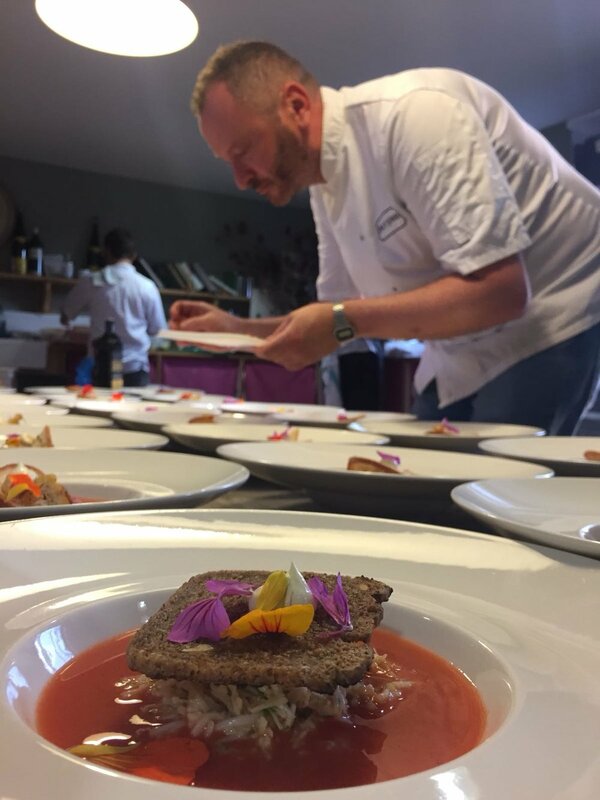 As Neil cooks, delicious taster canapés will circulate to whet your appetite for a post-demo lunch of Peelham Farm organic field-raised ruby veal with salsa verde, followed by organic raspberry and Katy Rodger's crowdie parfait. £50 per person, including a glass of fizz on arrival and tea/coffee after lunch. We're delighted to be joined by Nikki Welch, creator of the Whisky TubeMap, for this very special event to celebrate the water of life. Nikki will take you on take you on a whisky journey, exploring malts, blends and world whiskies with all the senses not just taste. She loves playing with whisky to show it in all it's facets, so she'll be mixing it into cocktails, adding extras and showing just how versatile whisky can be by pairing it with different flavours and textures of food. If you think whisky can only be served as a dram, you're in for a delightful surprise. Nikki will be using the WhiskyTubeMap to guide your journey, but the really important bit is your palate. Can music change whisky's flavour, does whisky taste different if you can't see it, and how do you get the flavour of whisky without the burn - all questions Nikki will answer. Let Nikki guide you through the myths and truths of whisky with delicious food pairings as you sip and eat your way through the evening. The event will take the form of a sit-down meal with a selection of canapés to start, followed by a main course and dessert. Guests will enjoy 6 whiskies on the night: a welcome drink and 5 matched whiskies served as drams, cocktail and mixed drinks. To reserve a place, please call 0131 2262211 or email eat@cafesthonore.com. Neil will be taking centre stage in the demo kitchen at Borough Market on Friday 4th May as he inspires the audience with a celebration of English Asparagus. 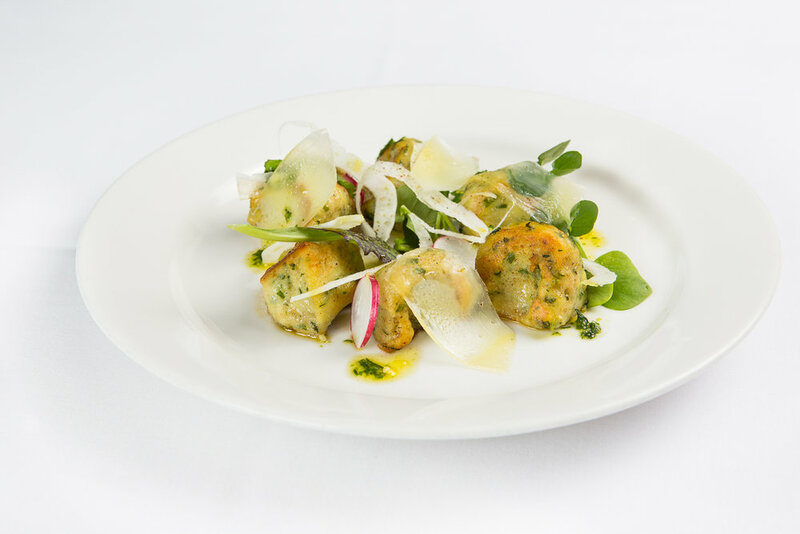 He will be championing the much loved vegetable, creating some fabulous dishes including fresh herb gnocchi with buttered English asparagus and grated Montgomery cheddar, as well as a sun-dried tomato, olive and English asparagus frittata with a salad of rocket, sheep's curd and olive oil. Neil has many more dishes in his line up and there will be the chance to taste them all. Join Neil for tips, tasting and recipes on Friday 4th May in Borough's Market Hall, 1pm -2:30pm. Neil takes us through a step-by-step guide of how to fillet mackerel. In just four easy steps, he makes it look so simple! Remove the head and guts. Insert knife just above back bone and remove the fillet. Using a filleting knife, remove the belly bones. Using the same sharp knife, insert it either side of the central pin bone line and remove all bones in one. The final boneless, skin-on fillet is ready for pickling, frying or grilling. "It’s a classic dish, normally made with apple or pear but why not a veg. This recipe calls for beetroot, but fennel or shallots work just as well. It’s essentially just a simple caramel with blanched veg on puff pastry - very simple, tasty and impressive. Serve with an apple and endive salad topped with crumbled Blue Murder cheese to add that creamy richness. Herbs like sage or thyme work well in the caramel. And have a go at rough puff pastry too, far better than any shop bought stuff!" Firstly, make a caramel by melting the sugar and butter together in the cast iron blini pan until it’s golden and caramelised. Then take the sprig of thyme and place it into the centre of the caramel. Next cut the beetroot into chunky pieces, and place onto the thyme and caramel. Cover the beetroot with the disc of pastry and prick a hole into the top and bake into a hot oven 200°C for 15 to 20 minutes until golden and cooked. Leave the tart to cool slightly otherwise it will fall apart. 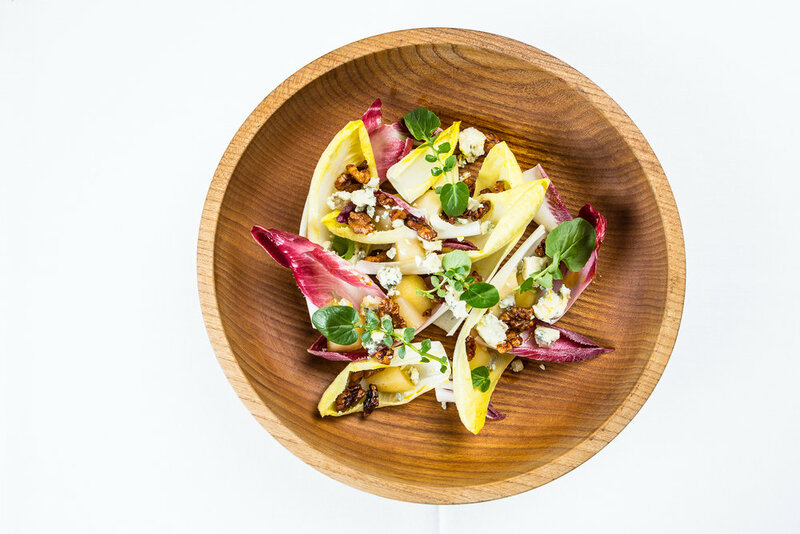 Whilst it’s resting, make the salad by adding the cheese to a bowl with the endive, apple, a few radish slices and some toasted nuts. Make a dressing by mixing together the oil, honey and mustard and drizzle over before giving it a season with salt and pepper. To serve, carefully tip out the tart out of the pan and onto the plate and garnish with the salad. Serve immediately. Remove the top and bottom of the onion, keeping the root intact. Remove the skin and the outer papery layer. Cut the onion in half, through the root. Cut vertically down, towards the root, but not slicing though it. Cut horizontally, 2 or 3 times depending on the size required, again keeping the root intact. Now you're ready to dice, until just the root remains. Join us on Saturday 24th March when Neil will be demonstrating how to make the most of shellfish at this exclusive masterclass. Expand your knowledge and learn how to create delicious dishes with lobster, langoustine, scallops, mussels, oysters and more! £45 per person, with a glass of fizz on arrival.